JOE LOCICERO LOVES HONDA. Putting fuel before the tank gets empty and changing the oil and fluids regularly and on time, was the secret of Joe, a mechanic from Maine, to reaches 1'000.000 miles on his cheap old Honda Accord. Regular maintenance is the key. SACO, Maine - Either by necessity or choice, many people drive a cheap car with twenty or more years behind. But the reason for the choice does not matter, since it is normal that as age advances, cars are becoming more problematic and you have to deal with small and major faults, making it at some point you have to get rid of them. In the same way does not think Joe LoCicero, a mechanic from Ohio 53 years old, which in 1996 purchased an economy 1990 Honda Accord with 74,000 miles on its odometer. Since then, Joe has been doing an average of about 62,500 miles per year, which would come being about 100,000 kilometers, due to his work that requires him to travel regularly around Vermont, Maine and New Hampshire. Just 15 years after Joe bought the car, has finally achieved its goal of reaching the incredible figure of 1,000,000 miles, or 1,600,000 km, or which is the same that make 40 laps around the earth. As a good mechanic, the maintenance that Joe has done to this cheap Honda Accord in these years has been great and is perfectly documented. HONDA HONORED HIM. He also was honored with a parade with music and dancing which most of the people of the town could see. He also did an interview for the TV and news. Although Joe has replaced the steering wheel, upholstery, seat belts and the fuel pump (with 741,000 miles!) the engine and the transmission of this Honda Accord continues to be the originals. LoCicero argues that although he hears how mechanically is getting older, it still has an amazing operation, and its cheap Accord has been recognized by the Japanese car-maker as the only vehicle that has exceeded one million miles (presumably referring to the U.S. and not the whole world). A NEW HONDA ACCORD. 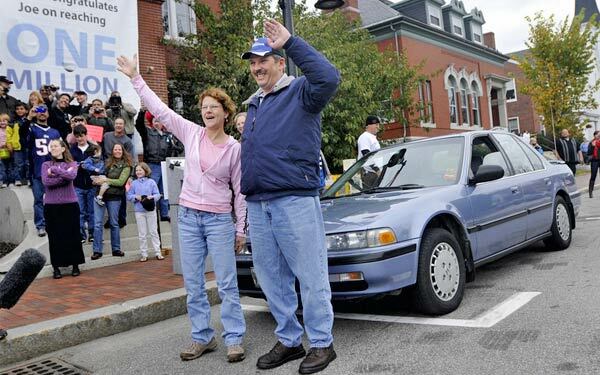 As a reward for his fidelity and good treatment to the car, Honda Accord gave to Joe a 2012 Honda with "0" miles. That is why Honda prepared a special event to honor this couple so peculiar, where they also gave Joe a brand new Honda Accord which we hope he also could get too many miles. 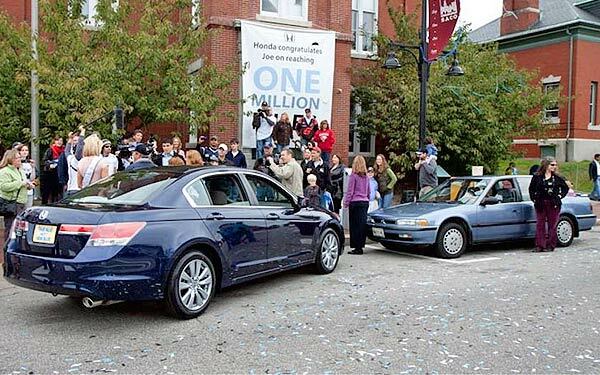 How Joe did to reach one million miles on his Honda Accord from 1990? Driving a Honda car with a million miles is an extraordinary feat. So how he did? Joe To start, we have read and followed the owner's manual and maintenance schedule. He is also a stickler for the fluids, he checked them every week and changed the oil every 5,000 miles as well as he did the type of oil change during the seasons (10W-30 during the summer and 5W-30 in winter). He has been faithful to the same mark of oil and never let it go below a quarter. Video — Honda prepared a special video to honor Joe for this achievement and leave him in history. Another important point is that, most people put gas in their cars when it is practically empty, Joe never did so. Also he is a creature of habit, Joe used only oil and air and fuel filters Honda. Joe never abused of the brakes putting much weight to his cheap Honda Accord, and he changed the fluid often. He also replaced the fuel pump as well as the cooling fans and the radiator twice. Video — Check the history from the point of view of the guy who sold the car to Joe. Besides the demanding maintenance, this feat of carrying his Honda Accord to the million miles, Joe also did it so because he wanted it and it was a goal set. He treated his Accord with respect and always drove it in a responsible manner. In fact, Joe has received only one speeding ticket in this feat of the million miles, which should also have been some kind of record or something. When it comes to driving, Joe is the man.